Ich finde den Neuen deutlich besser bemalt. Fand den erste viel zu blass. Auch das mit den Augen/Zunge lässt mich eher darauf schliessen das noch eine Leia/Slave mit Kette kommen könnte. Das der Sockel PVC ist stört mich hier gar nicht - ist halt keine Statue und macht das für meine Glasböden leichter. Der erste Jabba war ohnehin auch PVC. Mir gefällt der auch nicht so gut und schliesse mich vor allem karliseppel an. Sieht fast genauso aus wie die GG Version. Die Farbe gefällt mir nicht so gut, vor allem das Blau im Schulter/Armbereich. Schecht finde ich wie auch schon mehrfach erwähnt die sichtbaren Schlitze gerade am linken Mundwinkel und den Augen. Die Farbübergänge zu den Augen sind schon doch relativ abweichend von der Farbe zum restlichen Kopf sodass die Übergänge sichtbar sind. Mr. Crumb war wohl im Plastinarium und und sieht fast aus wie ne Ü-Ei Steckfigur. Die Base und co finde ich recht gelungen auch wenn Sie aus PVC sein sollte. So viele Jabbas gibs ja nicht aber die mir einfallen sind z.B. den Vorgänger, Black Series, Illusives Concepts, Attakus und die GG & Version, wobei mir die letztere am besten gefällt. Diesen hier würde ich eher auf den hinteren Rängen einordnen obwohl der im Sideshow live Video garnicht so übel wie auf den Bildern aussieht. So ich muss jetzt auch mal eine Lanze brechen für unsere Deutschen Händler. "Aber und das wird so kommen, werden unsere Deutschen Händler den Jabba wahrscheinlich zwischen 1000 und 1200€ einpreisen." Wenn ich nun die Preisgestaltung sehe bin ich positive überrascht. Wie racingsven schon sagte, ist der Preis besser als von jeden erwartet. Ich werde mich da überwinden denke ich mal! Werden wohl noch ein paar alte bekannte Neuauflägen kommen und auch ein paar Neulinge. When the illustrious Jabba bids you welcome to his palace, you will be met with many strange sights and delights- Jabba the Hutt definitely knows how to revel. Located in the Dune Sea on Tatooine, the palace is a hub for creatures, bounty hunters, entertainers, and criminals of all sorts. Friends and foes gather from across the galaxy in the presence of the Huttese crime lord. You may find yourself entranced by the live band, or tossed into the rancor pit to meet an unfortunate end. Get to know the creatures featured in Jabba’s palace with our helpful who’s-who guide! Jabba the Hutt kept a special aquarium full of Klatooine paddy frogs located near his immense throne, because the amphibious aliens are one of his favorite snacks. From the home world of Klatooine, the paddy frogs are naturally aggressive, and emit screams when panicked (especially before being eaten!). The Jabba the Hutt and Throne Deluxe Sixth Scale Figure Set includes a Klatooine paddy frog accessory, as well as a frog fixed in the aquarium accessory on the throne- can’t have Jabba without his favorite snack! The rancor is a large reptilian carnivore native to the planet Dathomir. They have immense jaws and strong skins that can resist blaster fire, making them formidable and frightening enemies. Jabba the Hutt kept a rancor as a pet, hidden in a pit beneath his throne room. Guests who displeased the crime lord were dropped through the floor and fed to the rancor, named Pateesa- Luke Skywalker defeated the beast, much to the sadness of its handler Malakili. Twi’Leks are a humanoid species known for their tentacle protrusions on their heads, called lekku. They hail from the planet Ryloth, and their skin could span an array of colors, including blue, pink, and green. Jabba’s palace contains a number of notable Twi’Leks including Bib Fortuna, the majordomo of the palace, and Oola, the captive dancer. 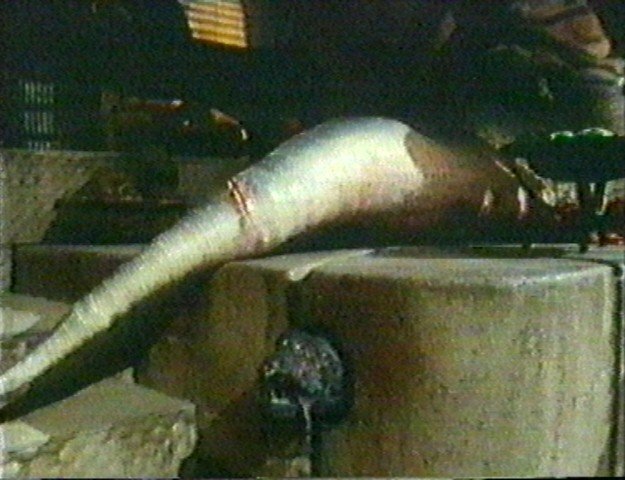 Bib Fortuna was deceived by Luke Skywalker‘s Jedi mind tricks, while Oola was fed to the rancor when she resisted Jabba’s orders. The Gammoreans hail from planet Gamorr, and are a race of green-skinned, pig-like creatures with large snouts and upturned tusks. They are large and stout, making formidable guards employed by Jabba the Hutt to protect his palace. 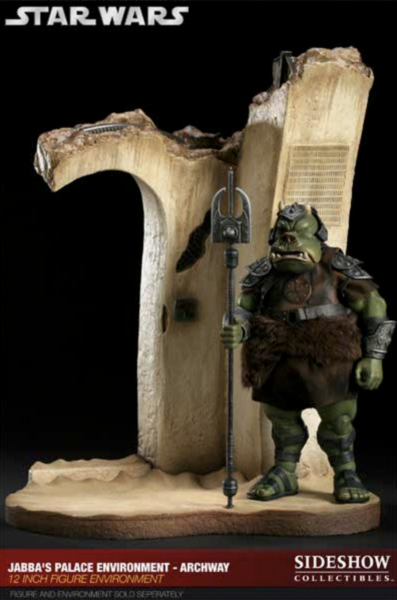 Two of the guards in Jabba’s employ were Gartogg and Jubnuk, Gamorrean boars who were not the most intelligent sentinels. They preferred axes and melee weapons to more advanced blasters. Jubnuk was eventually eaten by Pateesa the rancor. Max Rebo, leader of the popular Max Rebo Band, was a small blue Ortolan who played music in Jabba’s palace. He had a long, trunk-like nose and beady black eyes. His instrument of choice was the red ball jett organ, which was played with his feet. Along with the numerous other members of his band, Max Rebo was often hired to provide entertainment to sleazy clients and criminals, such as Jabba and his cronies. His bandmates included musicians like Droopy McCool and Sy Snootles. Sy Snootles, also called Miss Snooty, was a Pa’lowick singer in the Max Rebo Band that played Jabba’s palace. As a Pa’Lowick, she had long limbs and a trunk-like mouth, and yellow, spotty skin. From the planet Lowick, Sy Snootles was not only a singer at the palace, but also a spy and a part-time bounty hunter. She was in love with Ziro the Hutt for a time, but he abandoned her later, and she sought revenge. After the Max Rebo Band broke up, she took up a solo singing career. Rodians are a race of green-skinned aliens from the planet Rodia, known for their large, pupil-less eyes, slender snouts, and antennae on their heads. The Rodians were notorious for working as bounty hunters. Jabba employed several Rodians, including the infamous Greedo, whose cousin Beedo was in attendance at Jabba’s palace when Luke Skywalker infiltrated. The most recognizable Yarkora alien is perhaps Saelt-Marae, known by many Star Wars fans as “Yak Face”. Yarkorans are known for their elongated faces, with large noses and whisker-like hair coming from their cheeks. Saelt-Marae worked for Jabba, posing as a merchant who used his ability to mingle with Jabba’s guest to learn secrets and relay them to his employer. He traveled with many others on Jabba’s sail barge to witness the execution of Hutt’s prisoners. Buboicullaar, or “Bubo” for short, was another one of Jabba’s beloved pets kept in the palace. Bubo was a frog-dog, short and squat with only two arm-like limbs. The creature was seen as rather unintelligent, but Jabba enjoyed keeping him around. Bubo has even appeared in some Star Wars graphic novels. Of course, we couldn’t make a list of the infamous faces of Jabba’s palace without including a certain Kowakian monkey-lizard, Salacious B. Crumb. Known for his shrill, raucous laughter, Salacious served as the court jester for the Huttese crime lord. Originally from the planet Kowak, the monkey-lizard was responsible for entertaining Jabba and his courtiers with his annoying antics, in exchange for food and protection. 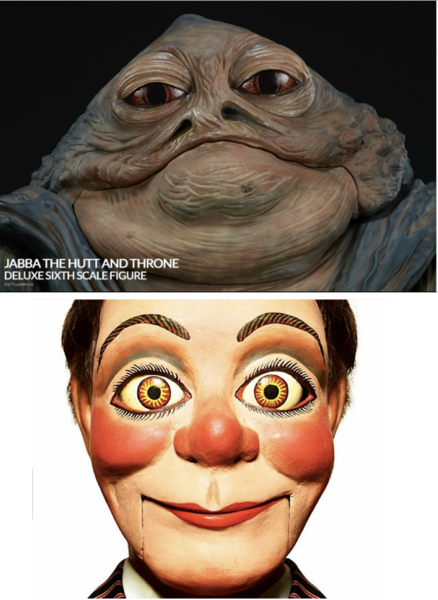 The Jabba the Hutt and Throne Deluxe Sixth Scale Figure Set includes its very own court jester, with an articulated Sixth Scale Salacious B. Crumb figure. He includes an alternate laughing head, so you can customize Jabba’s palace in your own collection, complete with everyone’s favorite pesky jester. The Jabba the Hutt and Throne Deluxe Sixth Scale Figure Set is available for pre-order now. With a variety of accessories and swappable features, you can add the ultimate Tatooine crime lord to your collection! Recreate your favorite moments in Jabba’s palace with additional Star Wars Sixth Scale collectibles. For more Star Wars figures to add to your galaxy of collectibles, click HERE. (07.04.2018 13:33)MalgusPryme schrieb: Werden wohl noch ein paar alte bekannte Neuauflägen kommen und auch ein paar Neulinge. Für einen Moment dachte ich schon daran, den neuen Jabba auf den alten "Steinthron" zu tauschen, aber trotz der intensiveren Färbung und gewissen ausgeprägteren Details, verdrängt er nicht den Reiz und Erinnerung, die an dem alten Koloss hängen. Letztlich sind es die Austausch-Ritzen am Mund, die den Zauber für mich platzen lassen. Und da sag ich nur "Archway"
Seiner Zeit nur 750 auf 4000 Jabba's - da hat der Mangel für das Stückchen Mauer zuletzt schon freche Preise um die 500-600 Tacken mutieren lassen ( von den grünen "Schweinchen", mit Ablösesummen von 300-400€, ganz zu Schweigen). Hier wäre eine Neuauflage doch für alte und neue Sammler gleichsam interessant!! Natürlich fehlt seit jeher eine Leia im berüchtigten Tatooine-Bikini - eine solche gut gemachte Figur, würde doch einschlagen, wie kaum eine andere - und die "Notlösungen"von Kotobukiya bis Gentle Giant entlasten. Oder gar eine tanzende Oola, die man sich bis heute nur im 1/5 Attakus-Universum beleihen kann. 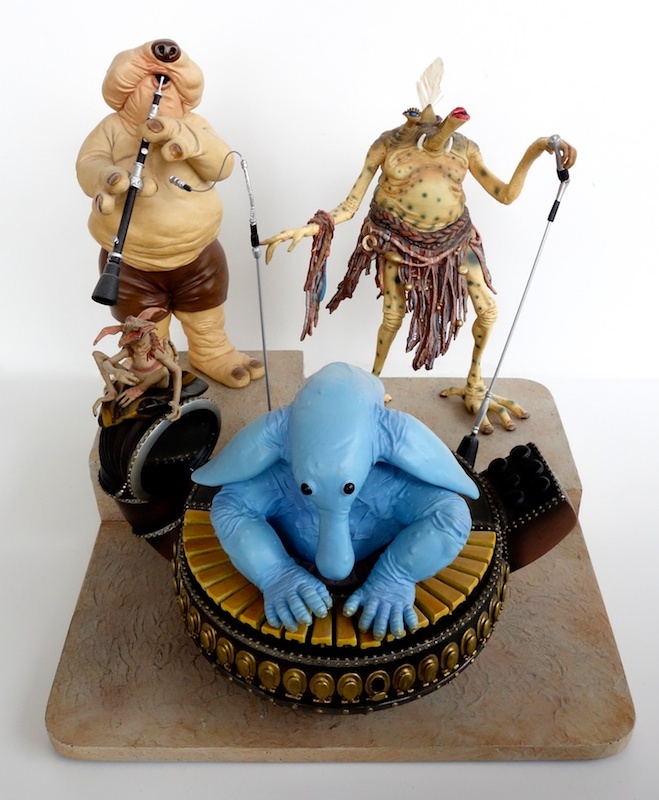 A propos Gentle Giant, eine solche MaxRebo-Band im 1/6 Sideshow würde doch keiner auslassen! Warum nicht auch einen B`omarr Monk? Oder Lando? Oder gar den Keeper? !